Finally. The Top 5. “Alien” makes it to No. 5 because of its innovation (at the time) and it’s stomach-turning gore. In 1979, no movie had done what “Alien” did. It took the basic stalking/slasher story and sent it to space. We have a group of people on a ship who have to make a stop on a random planet to check out an S.O.S. During their stop, one of them is attacked by an alien. Said alien attaches itself it his face. The face hugger eventually releases itself and the crew member is fine and dandy. For a little while at least. It turns out the alien impregnated the poor guy and he is about to give birth (through a bloody explosion of the chest). Out comes a tiny little alien, but it scurries away even before the umbilical cord can be cut. The human host is dead and the rest of the crew decide to hunt down the little creature before it can cause any more harm. The plan sounds a lot easier than it is. One by one, the crew members are stalked and eliminated while the alien grows at a rapid pace. Finally, Ellen Ripley (Sigourney Weaver) has been distinguished as the surprise lone survivor. She takes out the alien and escapes. 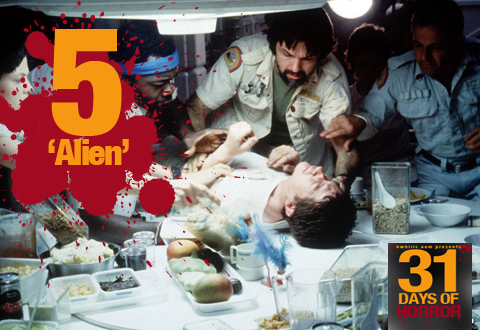 “Alien” is the quintessential movie for a lot of sci-fi horror fans. Even though I have a ton of respect for the movie, I could never put it in any No. 1 spot. It’s terribly dated and that ridiculously phony-looking scene with the talking robot head almost ruins the entire movie’s credibility. That all being said, it’s still a very scary movie. Director Ridley Scott achieves a lot by confusing the viewer. We never know exactly what’s going but there’s little time for that. Our minds are scrambled and vulnerable and then before we know it, there’s an alien mutilating someone else. Did You Know? The original title was “Star Beast”.